The Concert Design Allegro is first again. including important notice to orchestras. Allegro Performance Chair, stackable orchestra chair, frame of aluminum. One frame, back support is separate from frame, solid aluminum leg extensions adjust height range by 1″ increments. Popular for all orchestra musicians, violin, cello, oboe, flute, bassoon, all wind and brass players, harp, guitar, accordion. Orchestra stage/pit; music schools; home; studio. 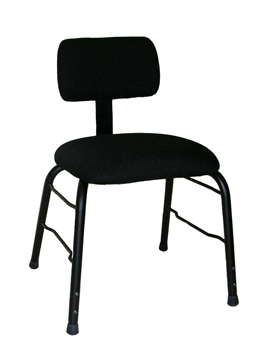 Allegro seat size 15.75″(40cm) width x 16.25″(41cm) depth. Refer to the Fact Sheet for important details, including custom work. 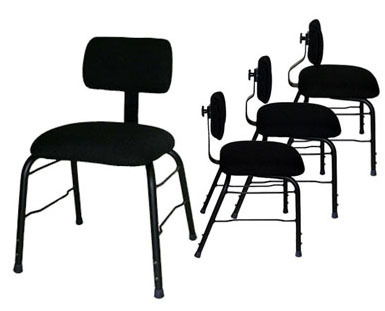 View chart of Allegro Chair heights. The aluminum frame is 50% lighter than other steel-frame chairs – a bonus for the stage crew. 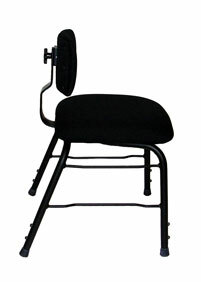 The back support is separate from the frame and can have a straight bar, a 2″ or 4″ bend. The back support is removable when desired. All back support bars fit into a special plate on the seat bottom. We have recently designed the lower end of the bar with a slot which allows 2″ in/out positioning. 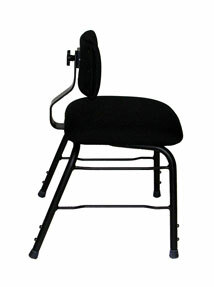 The entire back support can be moved in or out, whatever suits the individual musician’s preference. 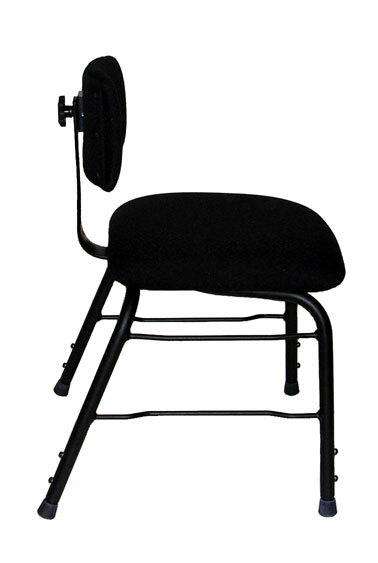 When the back support is placed in the best position, the handwheel under the seat is simply tightened. 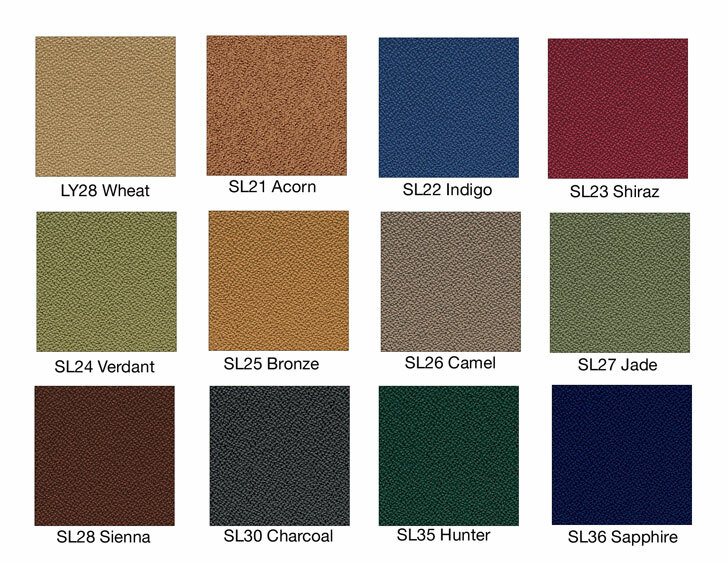 The Allegro Chairs are simpler, more comfortable and versatile! This does not impede stacking. 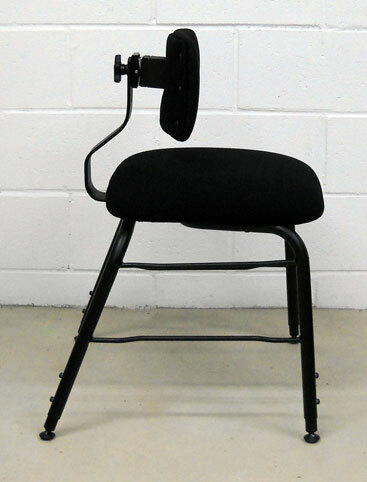 Allegro fixed back can provide support 1.5″ higher – remove screws and cover, reverse back cushion 180º, and reattach. Allegro with adjustable back; straight back bar. stacks to 5 with straight back bar. In addition, move entire back support in an extra 2″. 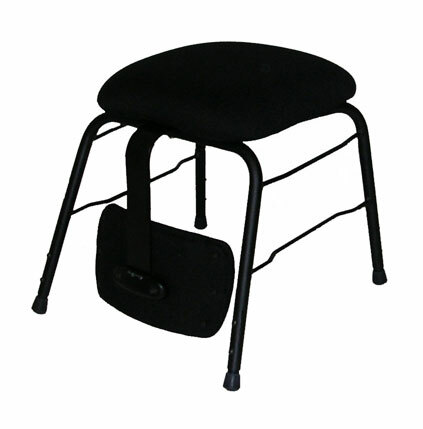 Allegro adjustable back can provide support 1.5″ higher on your back by partially unscrewing hand wheel on back cushion, reverse cushion 180º, and secure again. 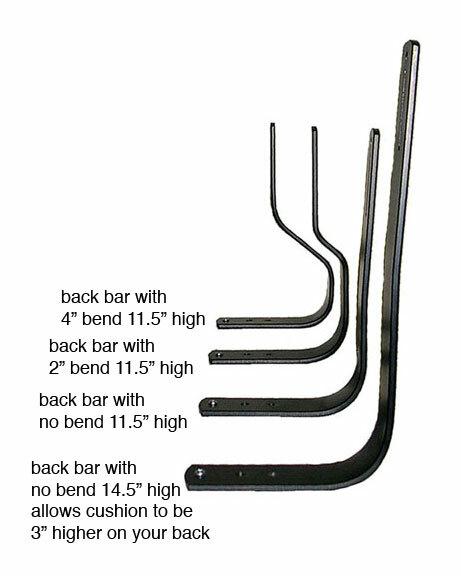 Allegro with adjustable back, 2″ bend back bar. 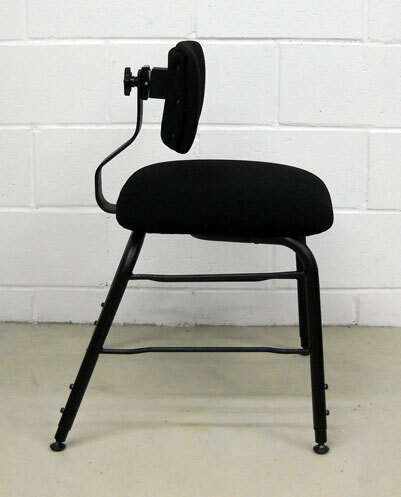 With 2″ bend, available seat room is 15.5″(39.3cm) front to back.This is for those musicians who prefer to sit forward, using less seat but maintaining maximum back support. In addition, move entire back support in an extra 2″. Excellent for smaller people, accordion, string and wind players. Back must be removed for stacking or place chair at top of stack. Specially suited for orchestra pit, studio, and rehearsal space. Allegro with adjustable back with special 4″ bend on back bar. With 4″ bend, available seat room this model is 13.5″(34.3cm) front to back. 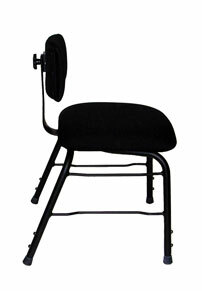 Again, this Allegro allows the musician to sit farther forward while experiencing maximum back support. In addition, move entire back support in an extra 2″. Back must be removed for stacking or place chair at top of stack. Specially suited for orchestra pit, studio, and rehearsal space.View these links below of extreme depth custom back supports with additional wood spacers to assist shorter people for playing cello with 3º seat angle. 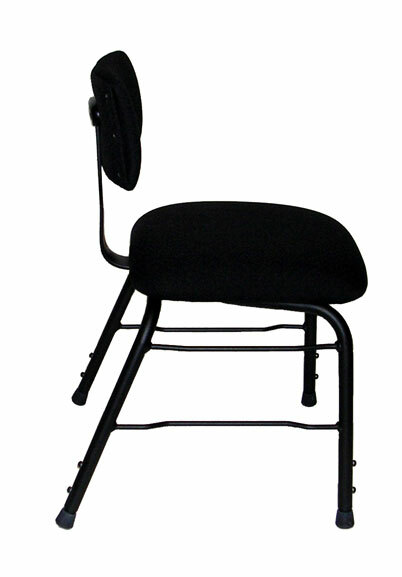 View back depth 1.5″(3.9cm) spacer 12″ seat room (30.5cm). View back depth 2″(5.1cm) spacer 11.5″ seat room (29.2cm). Allegro with Fixed Back stacked eight (8) high. Click on picture for enlargement. Dolly carts are made of aluminum. Quality caster wheels are available in red, blue, or grey as shown in photo. Shown in natural aluminum. 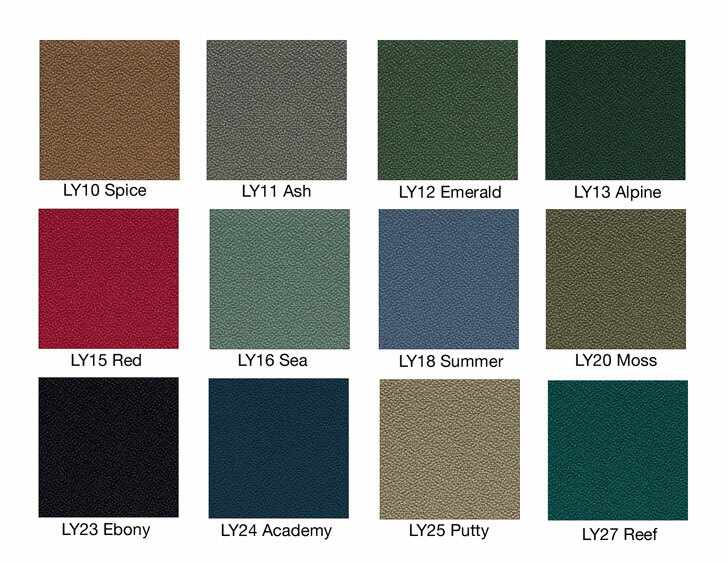 Also available, black polyester powder coated or anodized to your requested color, by special order and cost quote required. Go to stage dolly cart page. $250USD for natural aluminum dolly cart. 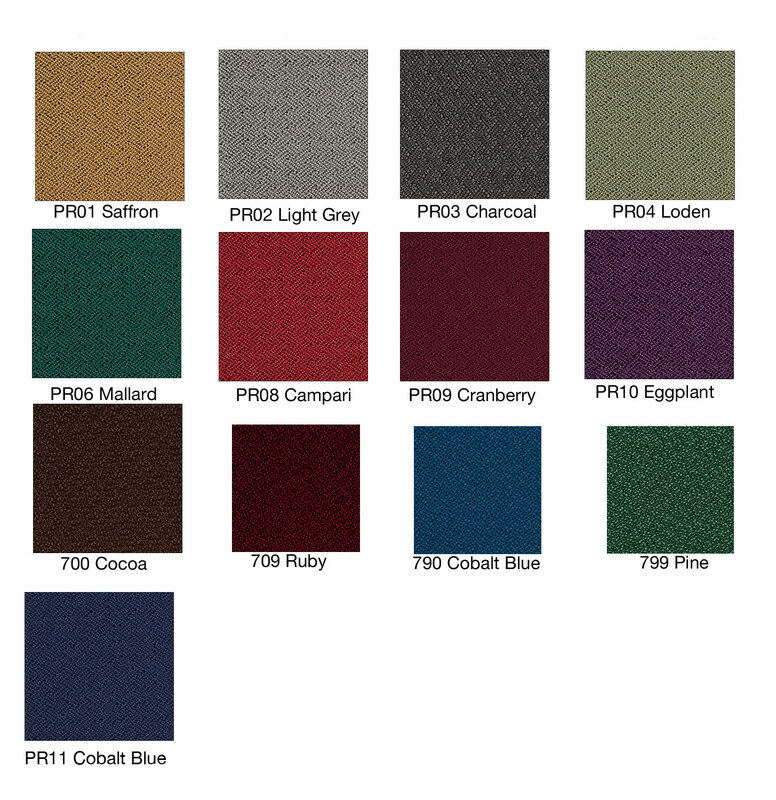 Cost for black polyester powder coated or anodized in your selected color by request. Allegro chairs on-stage at Detroit Symphony Orchestra. from frame and can be secured under seat.